Most puzzle platformers these days owe a lot to the enormously successful Portal franchise, but Quantum Conundrum bears the heavy burden of comparison more than most. 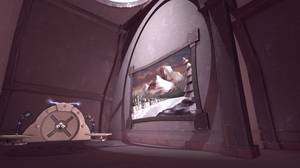 That's because developer Airtight Games has on its payroll Kim Swift, a former employee of Valve and level co-designer on the original Portal. Swift left Valve in 2009, obviously taking with her a substantial stack of experience and one hell of a resume. It's a shame then that the only real problem with Quantum Conundrum is that without Valve's deep pockets, it's an unremarkable and fairly laborious game completely bereft of the deeply satisfying humour and remarkable attention to detail found in the Portal series. Instead, to eke out comparative justice, it's necessary to drag out such genre tropes as Sabre Interactive's TimeShift from 2007, or even Raven Software's Singularity in 2010. They might have been big-budget titles for the time, but they're all hamstrung by the same lack of flow. By the time the game crawls to a point at which solving the problems becomes mildly challenging, the application of the only possible correct answer becomes a chore. The same is true for Quantum Conundrum, sans the big budget. 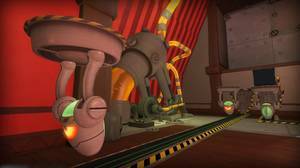 Played from the first-person perspective of a small child, the soft palette and cartoon-like animations manage to set the stage in an unassuming fashion. The backdrop – easily the largest mansion in recorded history, with enough barely decorated rooms to make Ceausescu blush – belongs to a mad professor, who also happens to be the protagonist's uncle. Due to some challenging inter-dimensional issues, he's found himself on the other side of a time rift and... well, it doesn't matter really. He's only present as a voice over the intercom, directing the player in the many facets of the mansion that are, inexplicably, designed to resemble that of a videogame. Although he does manage to excel in dishing out some of the flattest jokes since Melody Rules, which is no small feat considering quantum physics is a ripe playground for all sorts of one-liners that don't necessarily have to involve cats in boxes. The mansion is divided into coloured wings, each containing sets of puzzles that must be solved with the aid of the Interdimensional Shift Device (ISD), a glove-like apparatus with powers regionalised to whatever wing the player feels confident in exploring. Starting in the Fluffy dimension, an astonishingly large number of antique, free-standing safes can be manipulated to be placed on platforms allowing further progression. Why antique free-standing safes are the predominant measure of weight in this particular mansion is not explained, but after about the fiftieth reverse-weight-move-safe-apply-weight trick, there's a cup of tea that sorely needs making, and an half-unwrapped copy of Noel Edmond's biography left over from Christmas that is now the most appealing method of entertainment in the house. Pressing forward, the player is rewarded with a reversal in gravitational fortune, as the next area features large iron objects suspiciously resembling antique free-standing safes that are now ten times heavier than before. The next exciting change in localised physics will likely be fairly obvious by now, but just in case it isn't, it's a lack of gravity. Then there's the obligatory time manipulation, which sadly cannot be used to block access to the Steam Store from earlier that day. It is, strangely enough, the most solid of all the different physical dimensions, with some well conceived puzzles requiring lateral thinking to slow the pace of proceedings in order to solve. The game continues for an age in this fashion, one room blending into another with progressively more complicated solutions to problems that could have been avoided if Mad Uncle Quadwrangle had simply had a bit more support from his peer group, and a building supervisor with a conscience. Cheap deaths are to be expected in titles such as this – indeed, the excellent side-scrolling Limbo practically featured cheap deaths as a selling point – but at least with Limbo, there was a palpable sense of personal failure when player talent ran out. In Quantum Conundrum, death is a poorly timed jump, because first-person platformers shouldn't have instant death as a failure for missing a ledge. That the player can almost immediately spot how to resolve the puzzle and then must set about doing so without falling down a hole is a design philosophy born out of technical restraints from the '80s, and certainly belongs back there. Although the game is fast paced, requiring in some cases extraordinary acts of co-ordination, the controls feel weighty and incapable of feeding back with the kind of precision required to avoid extreme frustration. 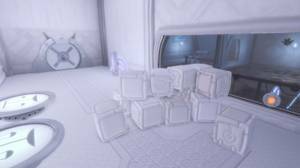 There's a level of dedication to the genre required in order to progress that isn't necessary in Portal. But all this said, the game is only US $15, and although hugely infuriating at times, still manages to offer up several hours of cerebral entertainment. Bonus points should be awarded if anyone can play the thing through to the end without turning off the background music, which has clearly been lifted from an elevator in a Disney building somewhere, or not pausing to reflect how inappropriate and darkly sadistic it is to caption each death screen with numerically catergorised examples of what deceased children will never experience. Even Limbo never went that far. But then, Limbo didn't need to. Anyone expecting anything close to the quality of Portal for fifteen bucks will be sorely disappointed. If approached as a distraction, disappointment may be mitigated to somewhere around "mild", and small pockets of enjoyment may occur. Ups Visually appealing, and leaderboards exist. The Slow dimension is indicative of how the game should have been. It's cheap. Downs Puzzles require a level of movement control that isn't suited to the first-person genre, which simply induces frustration. There's an awful lot of repetition, and very little humour.